Lot # 222 1979 Mercedes-Benz 450SEL 6.9 4-Dr. Sedan; S/N WDB11603612005879; Engine # 11098512006994; Anthracite Grey/Black leather; Estimate $18,000 – $24,000; Visually maintained, largely original, 3+ condition; Hammered Sold at $14,000 plus commission of 10.00%; Final Price $15,400. No Reserve. – Becker Grand Prix cassette stereo, alloy wheels, Michelin XWX blackwall tires, Euro headlights, sliding sunroof. – Good older repaint with rust bubbling up along the left drip rail. Dull, oxidized window and roof aluminum trim. Good chrome and interior. – An impressive performer when new, particularly in the context of the late Seventies when it ruled the road. It might be a little difficult to justify it these days when even the most mundane full-size American sedan has more power, but it has panache and has been well maintained even with over 100K miles. It’s hard to argue with the price it brought, which hedges all these issues. 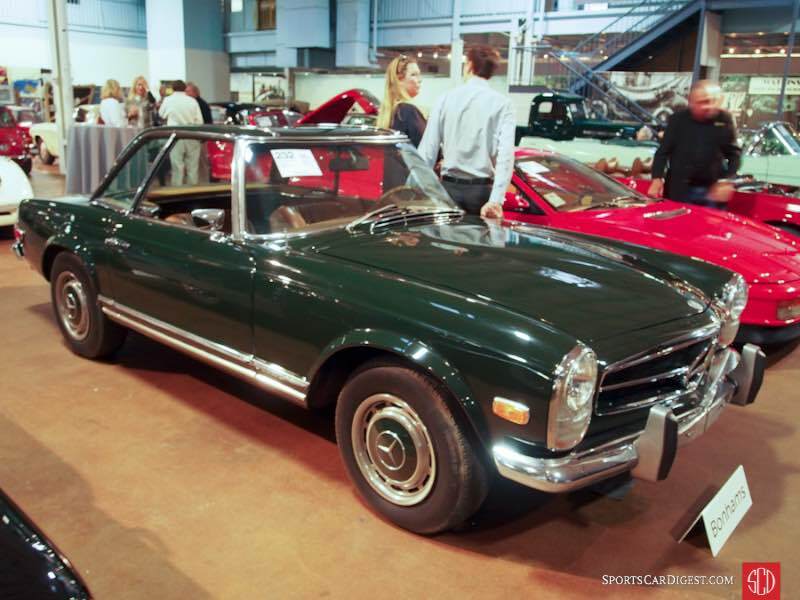 Lot # 232 1969 Mercedes-Benz 280SL Roadster; S/N 11304410003900; Green, Green hardtop/Tan leatherette; Estimate $45,000 – $60,000; Visually maintained, largely original, 3- condition; Hammered Sold at $40,000 plus commission of 10.00%; Final Price $44,000. With Reserve. – 4-speed, Realistic cassette stereo, hubcaps, trim rings, Michelin X blackwall tires, – Mediocre old repaint, original interior, torn driver’s seatback bolster. Thin trim chrome, sound but scuffed bumpers. Orderly original undercoat in the wheel wells. A sound largely original driver. – A rather pleasing and honest car in condition appropriate to its age and the history represented but distinguished by its desirable 4-speed gearbox. This result is reasonable for its condition and specification. 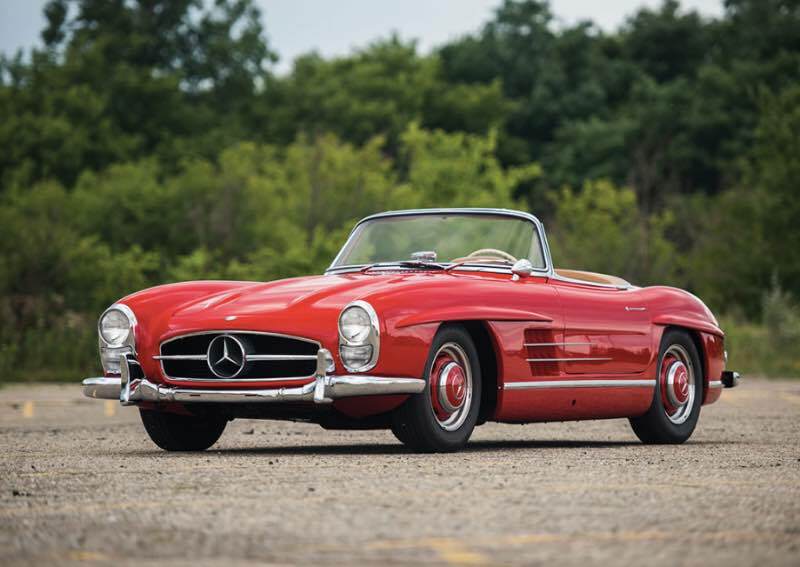 Lot # 142 1957 Mercedes-Benz 300 SL Roadster; S/N 1980427500397; Red/Tan leather; Black cloth top; Estimate $900,000 – $1,100,000; Older restoration, 2- condition; With Reserve; Hammered Sold at $750,000 plus commission of 10.00%; Final Price $825,000 – Becker Mexico AM-FM, body color wheels with hubcaps and dull polished rims, Dunlop SP Sport blackwall tires, Talbot mirror. – Excellent older color-changed paint, chrome and interior. 1958 engine. Underbody was restored like new, as was the engine compartment, and both now show a little age and minimal use. – Back in 1993 this 300SL crossed the block fresh from restoration at Auburn Spring on a reported high bid of $191,000. It has passed the test of time well and today still looks great. It should be a fine car for tours or spirited weekend drives while holding its own in the gathering points at the beginning or end of the day. The price it brought is entirely appropriate to its history and condition. 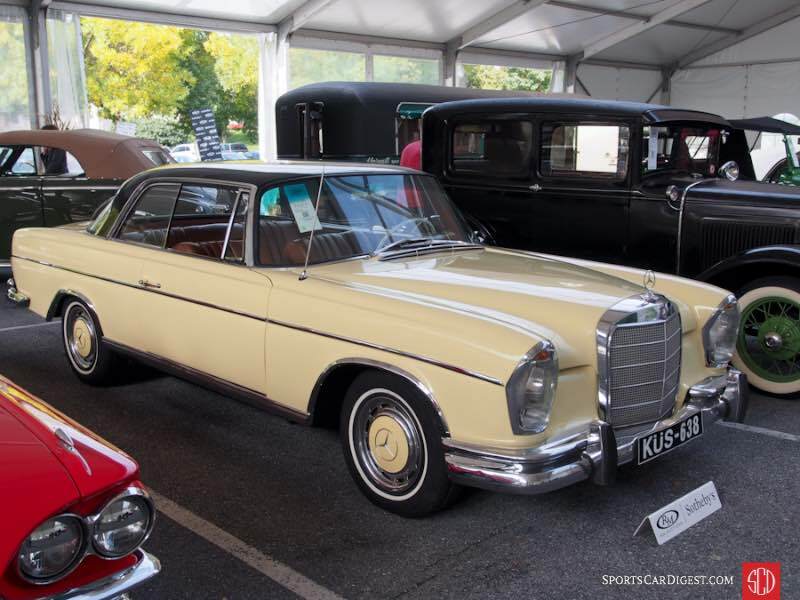 Lot # 162 1965 Mercedes-Benz 220 SE Coupe; S/N 11102110079804; Light Yellow, Black roof/Brown leather; Estimate $40,000 – $50,000; Visually maintained, largely original, 3- condition; No Reserve; Hammered Sold at $25,000 plus commission of 10.00%; Final Price $27,500 – 4-speed, Behr air conditioning, Becker Europa AM-FM, wheel covers, narrow whitewalls, white shift knob and steering wheel, Euro headlights. – Underbody resprayed with sealer while assembled. Exterior repainted over old paint and poorly matched on the cowl panel. Filled body panels. Bad window sill chrome on both doors. Worn window channels and seals. Tired, used and fluffed up with a superficial repaint many years ago, it’s a used car. – A seriously needy 220 that brought a price recognizing its many needs. 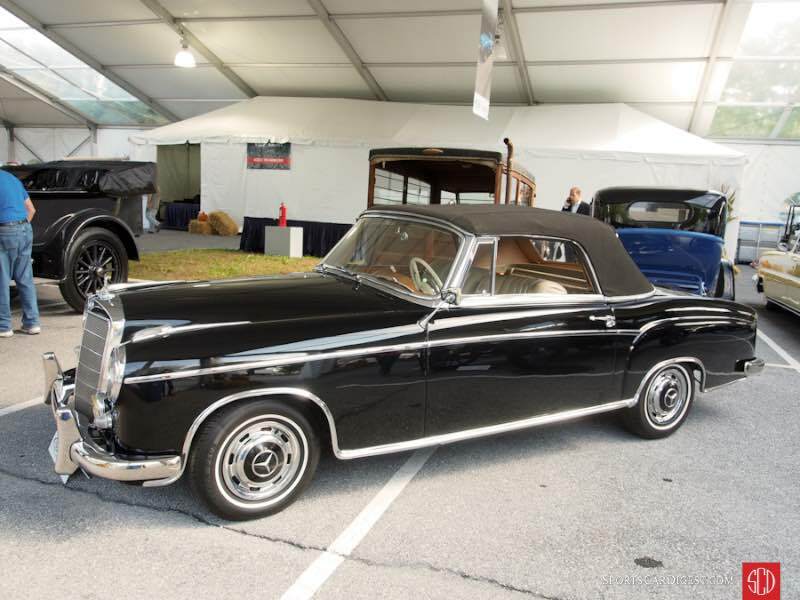 Lot # 231 1960 Mercedes-Benz 220SE Cabriolet; S/N 12803010002524; Engine # 12798310000081; Black/Parchment leather; Black cloth top; Estimate $130,000 – $150,000; Visually maintained, largely original, 3- condition; With Reserve; Not sold at Hammer bid of $90,000 – 4-speed, Blaupunkt multiband radio, wheel covers, narrow whitewalls, Hella fog lights, service records. – Bought new by Theodore Roosevelt III. Quickly repainted over old paint and badly repaired dings in both doors. Sill molding doesn’t match the rear fender contour. Original upholstery is surface creased and sound. Good newer top. Cracked fog light lens. Tired interior wood with scrapes, cracks and varnish loss. Decent chrome. Original, dirty, undercoat in the wheel wells. Poor hood fit with a vast rear gap. Said to be recently mechanically serviced with a rebuilt FI pump – Famous family history notwithstanding, this is a tired 220SE with many needs and only limited credit for preservation. Its high bid here is modest, but has room for unexpected issues. The bidders were conservative, and it could have brought a price into six-figures without being expensive. Lot # 635 1965 Mercedes-Benz 230SL Roadster; S/N 11304210015581; Ivory, Ivory hardtop/Red; Visually maintained, largely original, 3+ condition; No Reserve; Hammered Sold at $59,000 plus commission of 10.00%; Final Price $64,900 – 5-speed, hub caps and trim rings, Blaupunkt AM/FM pushbutton and 8-track stereo. – Two-owner car bought new in Saskatchewan. New top, brake master cylinder and muffler. Repainted at some point with a little bit of orange peel right below the windshield. Otherwise good and shiny. Aged but very well kept and recently detailed engine bay. Some paint flaking off the wheels. A few light scratches on the front bumper as well as a few big ones. Fantastic original interior other than the wood trim on top of the dash, which is dry and cracking. A great survivor showing 52,486 believable miles, although it would be even more special if it still had the original paint. – The old paint, scratched bumper and dried out wood did this otherwise well-preserved old 230SL no favors but all of that and some more can be readily addressed at this price, a good value in a 4-speed/hardtop 230SL. Lot # 166 1962 Mercedes-Benz 190SL Roadster; S/N 12104010025586; Black/Red leather; Black cloth top; Estimate $140,000 – $160,000; Visually maintained, largely original, 3- condition; With Reserve; Not sold at Hammer bid of $92,500 – Hubcaps, trim rings, whitewalls, Solex carbs, no radio. – Sound but superficial old repaint with corners not attended to and cracks under the windshield posts. Good upholstery but worn old carpet. Good chrome and new top. The engine has been redone but not the compartment it sits in. Cracked fuse box cover. Underbody repainted over old undercoat. A superficial, rushed old cosmetic redo. – Hastily restored to look good from 20 feet away, the closer you get the more issues appear and up really close they are myriad. The estimate range reflects a fully restored car, which this isn’t, and even the reported high bid here is generous. 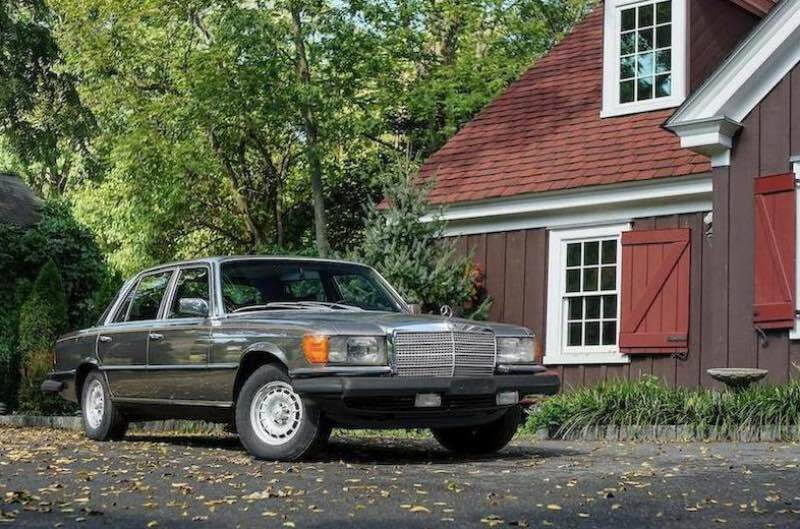 Lot # 180 1971 Mercedes-Benz 280SE 3.5 Coupe; S/N 11102612001771; Silver-Blue/Dark Blue leather; Estimate $100,000 – $125,000; Visually maintained, largely original, 3+ condition; With Reserve; Hammered Sold at $75,000 plus commission of 10.00%; Final Price $82,500 – Automatic, Behr air conditioning, power windows, Becker Europa AM-FM, fog lights, wheel covers, Michelin narrow whitewall tires. – Good repaint except for two blemishes on the front of the hood. Bright major chrome; badly pitted side window and vent frames. Clean and detailed engine in an unrestored compartment. Good refinished interior wood and new upholstery. Clean underbody. A competent superficial cosmetic redo to presentable driver condition. – 111-series Mercedes are wonderful driving machines but this example is only superficially redone to look good from ten feet and deserves no more than the price it brought here.